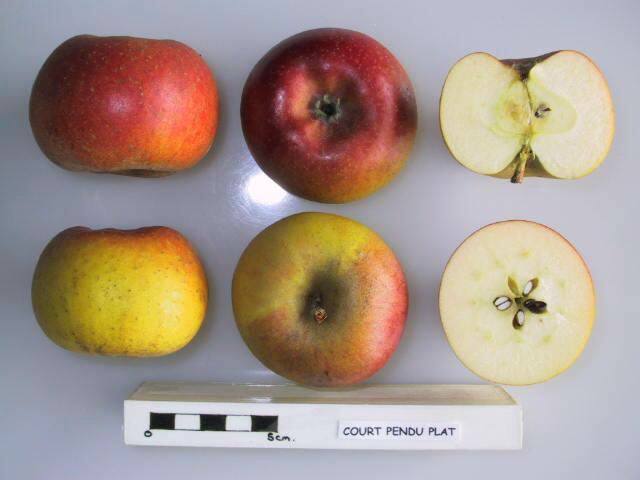 Court Pendu Plat is old apple variety from France, with a history dating back to the early 1600s and many earlier references. It was popular in Victorian times and still has a small following. With such an ancient lineage it is perhaps no surprise that Court Pendu Plat is quite different from many other varieties. The most distinctive feature is the strange flattened appearance. The base is highly inverted and you can clearly see the flower stalk from which the apple formed. The colouring is light green flushed with orange and red. The flesh is very dense, not soft but not crisp either. Cutting into it with a knife feels a bit like cutting into a hard cheddar cheese. There seems to be very little juice, and it is not really apple-flavoured at all. The flavour is fruity and strong when picked, and sweetens by Christmas. It is not actually very appealing when you first bite into it, yet is strangely "more-ish", with a flavour which is hard to define. It can also be used for cooking. 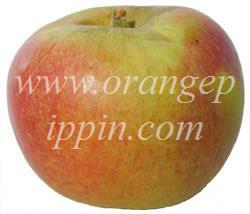 Although we have no proof, we think Court Pendu Plat could be somewhere in the ancestry of Cox's Orange Pippin. The size, flattened shape, colouration, and complex flavours of Cox are all there in Court Pendu Plat, albeit in a more primitive form. Cox's probable parent - Ribston Pippin - was apparently grown from a seedling brought to England from France in the early 1700s, a time when Court Pendu Plat was well-established on the Continent. Dense, fragrant, wonderful flavor. Bought at a Greenmarket in New York City October 2015, in a one-week appearance. Wish I had bought more as all sources say they are wonderful keepers -- I will look for them again this time next year. Although CPP is often quoted as being scab resistant, it is the fruit that has good resistance to scab, but the leaves are not resistant to scab. CPP also has "some resistance" to mildew and canker, but it is not immune. Late flowering can cause problems with pollination, but there are a handful of good-quality, organic-suitable, late-flowering varieties that are worth growing alongside CPP - such as Edward VII and Crawley Beauty. In my region, I find that MM106 rootstock often tends to bring varieties into flower slightly earlier (one pollination group earlier) than the other rootstocks, which could allow clever rootstock selection to slightly bring forward the flowering time of CPP. Additionally, if planting more than one tree, if the CPP is planted in the sunnier spot and the other tree in the shadier spot, you may also bring closer their *relative* flowering times by one pollination group as a result of the CPP warming up more quickly in the spring. The very-slow-growing nature of CPP leads me to suggest a somewhat stronger rootstock than you'd normally consider. In a collection of trees I'd suggest that CPP has a size larger rootstock (e.g. MM106 if planted with "average-vigour" M26 trees) to allow the CPP keep up with the growth rate of its companions. This variety looks interesting: scab resistant; strong unusual flavor, long keeper, Heritage! Anyone in Canada or the States who have it care to say how it is performing for you? Late bloom can be a plus in Spokane. Last frost is often in early May, this year was 24th May 2010. We've grown this variety for a number of years. Ours are much more russeted than the one in your picture, and reddish golden brown when ripe, certainly not pale green! They are small, and very flatttened, and the late flowering means that pollination is a problem in many seasons. However they are delicious when ripe, which is rarely before Christmas. They are sweet, spicy and aromatic. The flesh is slightly dry like many russets. Hazel, There are very few varieties that can truly be said to be pre 17th century. Derek at Bernewode Plants has done a great deal of research into the early varieties and he is your best bet to source them. Those that come immediately to mind are Nonpareil and White Joaneting as well as CPP. 17th Century apples are a little more identifiable. The best original source is John Worlidge, who wrote in the late 1600's, particularly his Vinetum Britanicum (1678, 2nd Ed). He specifically names Margaret (available from Brogdale), Devonshire Quarendon (Keepers Nursery, et al), Genet Moyle and Catshead - all of which can be sourced quite easily. The great Ribston Pippin was also planted in 1688 (Rogers of Pickering). Any or all would do very well in Bristol. It is also claimed that the greatest 17th Century apple, the Redstreak, has also been rediscovered (Brogdale, Matthews) although it remains to be seen if this can really be said to be the apple of our ancestors. I want to buy a pre 17th c variety of apple if I can for my garden in Bristol... have you any advice on / pictures of the tree growing I can see.. where did you get yours ?? thanks hazel. I have had an excellent crop of these apples this year, and have just started to pick them (02/11/08, after first frost). Mine are flatter and matter, like Jim's of Wakefield. The longer I have left them on the tree, the more yellow some have become - it has not been the sunniest Summer or Autumn. I was delighted to read that they are going to continue to improve in eating between now and the Spring as I found them rather hard on picking. The photograph you have does not look much like the fruit I get from the tree I grow as Court Pendu Platt. My fruit are flatter, and the green base colour is more matt with deeper matt red colouring. CPP flowers very very late, often when no other apples are flowering, so pollination can be a problem. Peter Wellbery Smith grows this just south of the Wash near King's Lynn. He says March is the best month for eating. The ones i have in front of me from him (8/02/08) are already good. Discreet but deep in flavour, spiced and hard and utterly toothsome.